I came home with my ginormous polish haul last Friday only so disappointed that my evening plans had been canceled because it meant I could sit down and start swatching my new pretties right away...only I was distracted by a sudden, desperate need to give this blog a makeover. So, hey, new layout! But when I needed a break from over-obsessive Photoshopping ("Hmm, this bottle isn't quite red enough...no, wait, now it's too red...") I took some time to try out some of my new polishes, starting with Fast Track, representing District 6 (Transportation) in the China Glaze Hunger Games collection. Fast Track is an interesting polish. It has a tendency to go "mannequin hands" on a lot of people, but I could not resist the gorgeous, golden shimmer in that bottle. The formula was great, if a little thin. Even the first coat showed a lot of its gold highlights, but the rest of the colour practically faded into my skin tone. The second coat was quite a bit better. Still smooth, still shimmering all pretty and golden. Nearly opaque, despite the thinness of the formula. I still wasn't really seeing the tan colour very much against my skin, but with some VNL still showing on a couple of nails, I decided to keep going. I'm glad I did, too, because the third coat made a big difference. I got the call on Friday that the new OPI Spider-Man polishes were in, which meant it was time to go nail shopping! I came away with my two absolute must-haves from this collection, Just Spotted the Lizard & My Boyfriend Scales Walls, as well as some of my other OPI wish listers! I was so excited to see the Zoya Beach and Surf collections in person at last and couldn't resist grabbing several of them (not that I tried especially hard...). I also scored their last bottle of Zoya's beautiful, orange flakie, Chloe! A couple more of the Hunger Games polishes by China Glaze were still in stock (no joy on Luxe and Lush--I was way too slow!). With all these finds, plus a few more couldn't-resists, this was easily my most awesome nail shopping trip ever. Coming soon: swatches and more swatches! A few days ago I posted my first successful galaxy nails (or nebula nails) and mentioned that since I'd taken pictures along the way, I might try to post a tutorial on them. But instead of being sensible and doing that, I started over from scratch, just to see how they might turn out this time around. 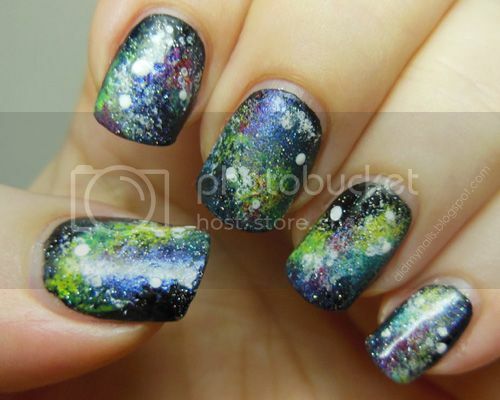 If you're interested in my first picture tutorial, how to do galaxy nails, please read on! Despite my growing interest, I was stymied for the longest time by the fact that I had no idea where to buy nail polish in Hong Kong. Many salons here sell OPI, but they charge around $17 US a bottle. As an alternative, people often recommend Sasa, which is a chain of beauty supply stores that sell everything from eyelid tape to designer perfumes, but while their nail polish is much, much cheaper, the stock is unpredictable and unfamiliar. Between these two extremes it was difficult to get a good lacquer fix. Weeks of frustrating web searches for "nail polish" and "Hong Kong" either led me to the OPI Hong Kong collection or online/eBay retailers that are based here but don't seem to have an actual store, but after a lot of digging I finally found Cher2. This is exactly the polish I've been looking for! 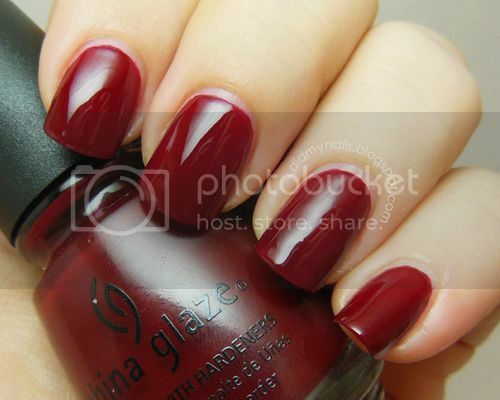 China Glaze Drastic is a dark red jelly that's just ridiculously, deeply luscious. For ages I've been trying to find a dark, blood red that doesn't veer into burgundy or vampy black, and this one fits the bill perfectly. Drastic glided on very smoothly. And amazingly, about a coat and a half (I'm still working on application technique, so my coats can be a little thick) was very nearly enough for full opacity despite the jelly finish. There was a hint of VNL, though, so even if I hadn't wanted to even out my paint job, the second coat was welcome. Today I'm posting a totally original design that I totally made up all by myself! Okay, yeah, not so much, what with it being all over Tumblr and YouTube about a year or so ago, but since I'm a little bit late to the nail art party, this pretty design was a fun, new project for me to try. YouTube has tons of tutorials for variations on this theme, but two that I watched in particular, by SweetieLolliee and cutepolish, cover all the basics. I tweaked my colours a tiny bit and added a little embellishment to the leaves, but I was surprised at just how easy these adorable nails turned out to be! Third time is the charm! I've tried galaxy nails (or nebula nails) twice before, but this time I think it finally clicked. The technique is deceptively simple once you get your head wrapped around it, and while I still have room to improve--there's always room to improve--I can't stop staring at the results. 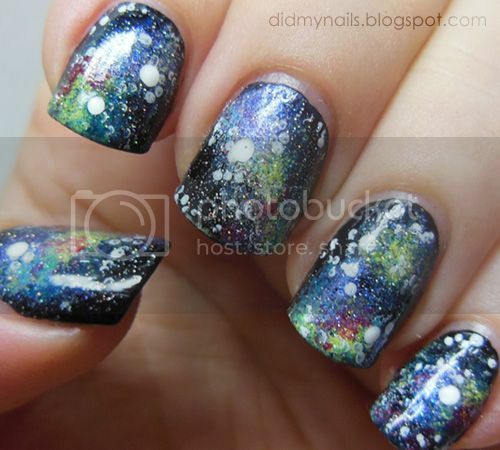 I don't know how many times I must have watched cutepolish's tutorial on galaxy nails over the past month or so, but as easy as she made this awesome technique look, I was still having trouble translating those simple instructions to my own hands. Then I realized that while I was focused on trying to duplicate cutepolish's great results, on following her process as exactly as I could, I wasn't letting my own imagination come into play, and letting go of the idea of "perfecting" this technique ended up improving my results immensely. My husband and I spent the past few days out at Hong Kong Disneyland celebrating our anniversary and had a wonderful time! Continuing HK's recent dreary streak, we had a lot of rain, but since we've done the park tons of times, this mini-vacation was more about loafing around our room, watching the evening fireworks from our window, and stuffing ourselves stupid at the hotel buffet. The sun did come out for a few hours on Tuesday, and in between dragging Husband from ride to ride and waiting to melt in the insane heat like one of those guys at the end of "Raiders of the Lost Ark," I found a minute to snap a picture of my new polish, Zoya Skylar. Yes, I was actually carrying this bottle around the park with me. I'd been wearing Skylar for almost two days at this point and hadn't had any good sunlight to swatch it in yet, and that's when it finally hit me; it was time to build a light box. It feels like Hong Kong's been nothing but gray skies and rain for ages, so I wanted something bright and cheerful on my nails. I had a giant bottle of filtered tap water sitting out at room temperature just waiting for me to give water marbling another try, and this time it didn't end in messy, dismal failure--yay! The sun actually poked its head out of the clouds for all of about 18 seconds, so I zoomed downstairs to nab a quick picture or two. Colours are OPI Need Sunglasses?, OPI In My Back Pocket, and China Glaze Aquadelic (I'm clearly hooked on blue these days). I laid down a coat of OPI Alpine Snow first, which really helped the colours pop. That white managed to peek just a little bit around a couple of edges, but it's not a "real life view" big deal. Some of the lessons I learned this time about how to do a water marble manicure are probably blindingly obvious to people who've done a few, but even after reading and watching several tutorials, it still took some trial and error to figure out some of the little details. Having all of one gradient manicure under my belt, you'd think I'd be sensible and practice a bit, but I've never been very good at being sensible. Instead, I plowed ahead and decided to have a go at a three-colour gradient. The lovely lady behind Criminal Nails was sweet enough to suggest I add a "Follow Me" gadget to Did My Nails. She was also my first commenter, which, yay! Being new, I haven't gotten a lot of page views yet, which is of course to be expected, and I've been so excited to see that tiny number climb just a little bit--and then I discovered that most of those "hits" have actually been coming from some automated adult-site spambot, which gave me a sad. After that, her kind words totally made my day. OPI DS Extravagance is a full-on stunner. Straddling the line between pink and purple, it's what I'd call a fuchsia grape. The colour is lovely, but this polish's rep as a good holo is what really landed it on my wish list. Even in low light indoors, my husband's succinct review was, "Ooh, sparkly!" Then I took it outside, and... You know how people tell you that pictures don't do a polish justice? Pictures do NOT do this polish justice. So here, have a picture! The first words out of my mouth were, "Holy mackerel!" Yes, I actually said something that corny. Out loud, even. But faced with the awesome power of Extravagance's shimmery, holographic sheen, I was helpless to retain my cool. Before I start gushing endlessly about the rainbow brilliance, though, I'll diverge and gush a bit about application and formula. I am delighted with the formula! I'd read that some people found it a bit runny, but it went on like a dream for me--I actually gave a little gasp when I saw how smooth it was! It covered beautifully in one coat, and when I went back over to catch some edges I'd missed, it settled very nicely. 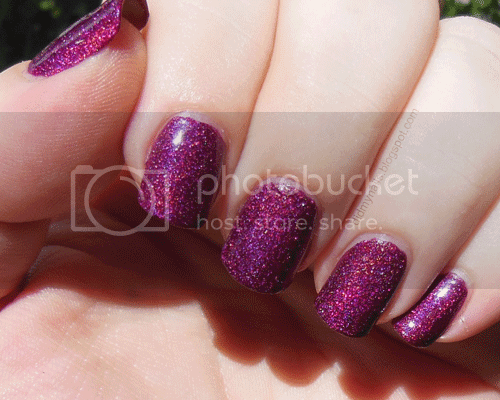 The swatch above is without any top coat, and it really does shine like leather, especially in sunlight. I could have happily left it there, but I still wanted to test drive Color Club Covered in Diamonds, my first flakie polish, with it. The pairing did not disappoint! I still had glitter in my head from my earlier plans, but rather than obscure the gradient with something more opaque, I went with OPI Pirouette My Whistle from the new NYC Ballet collection. Quick top of SV, and I'm actually pretty pleased with how my first gradient attempt came out. It was raining pretty hard last night, and I was surprised to notice...I mean, I totally did it on purpose...that they looked a bit like the rainy, gray sky! Oh, that giddy glee when you get home from polish shopping and lay out your new goodies! Finds included Essie Marshmallow, Jazz, and Navigate Her; Liquid Leather and Sea Spray from China Glaze; OPI I Lily Love You, Servin' Up Sparkle, Did It On 'Em, Don't Touch My Tutu!, and Thanks a Windmillion; and my first flakie polish, Covered in Diamonds by Color Club. I really should swatch some of these before I dig in, but I have a couple of ideas already I'm itching to play around with. As always, though, no telling how those ideas will translate from brain to fingers. I'll keep 'em crossed! So I made a header image and picked some link colours, but then what? Seems like the hardest part of any project is just getting it started, so rather than spend ages obsessing about some magical, perfect topic for my first post I'm going to go with, simply, what's on my nails right now. It's not a brand-new look, but it's one I enjoy revisiting. YouTube has several good tutorial vids for this style, each with its own variations, such as the ones by Cutepolish and XUrbanBellaX. 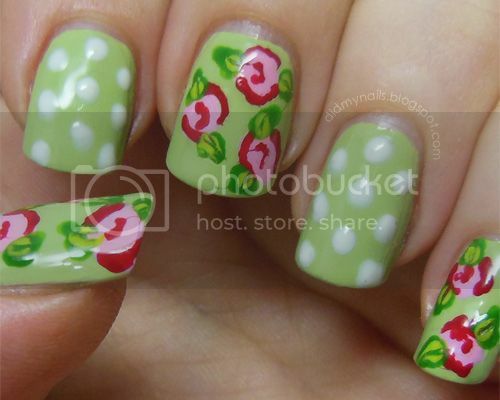 Like many, I used For Audrey (China Glaze) for the background; then I did the flowers with Alpine Snow (OPI) and Passionate Pink (Revlon Colorstay). 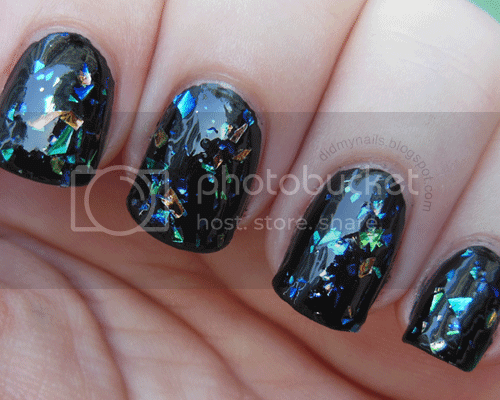 The black is a striper from Orly, and I coated the whole thing in some China Glaze Fairy Dust. I've had it on for several days now, which is why there's a little fading and some cuticle chipping, but again, I'm really just showing where my nails are when I started this blog. If I tried to go in and tidy them up, I'd start debating about redoing this one or going with a different design...or should I swatch a new polish instead... and then I'd whirl off into obsessing over what to do instead of just. getting. started. Next step: obsessing about what to do next!